Mark first began walking the campaign trail in Shapiro's Deli in Indianapolis, where he formally announced that he had filed to run for U.S. Senate for Indiana. You can read about it here. Below you can find more pictures from his campaign. This whole thing would not work without our valuable volunteers. Frank and Coleen have worked so hard. We were also joined this weekend by Coleen’s son Matt and Athena, one of Coleen’s best friends. Back at it. Getting more signatures at the gun show in Princeton. 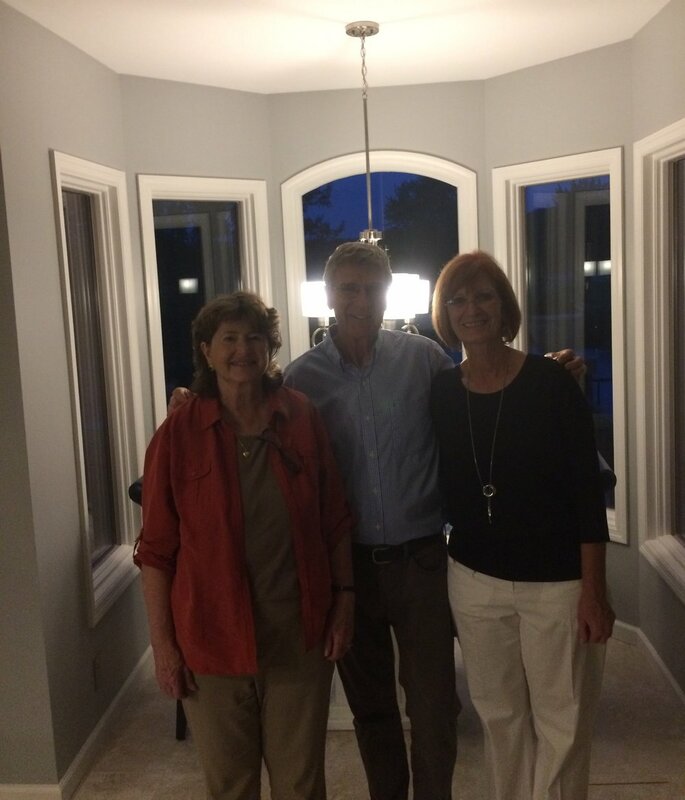 I took Nancy’s picture with Linda Freeman and Craig Overton. My brother, Matt, came down from Michigan, and my neighbor Gayle Came up from Kokomo, and we worked hard at the Auburn gun show. We got a lot of signatures. Today, I was able to join the right to life walk in Fort Wayne. Setting up for the Auburn gun show on Friday night. It has been an awesome weekend, but now it is time for the troops to regroup at the Hampton. On Wednesday, I was able to attend the right to life walk in Indianapolis. A great volunteer Renae, please join here with two Purdue students. We were at the send off for the national guard deployment in Kokomo. It made us proud, but it made us sad. We sat behind two young families, one with the father being deployed and one with the mother being deployed. They were both holding their young children. We told them we would be praying for them. Still in Terre Haute, Nancy and I were out past 11:00 gathering Vigil County signatures. This morning, we enjoyed worshipping at the Maryland Community Church where we met some very kind people. I am pictured walking in with my son Daniel. This weekend, I was invited to say a few words at the Vigo County Republican gathering in Terre Haute. We enjoyed some of the best pork chops ever prepared by Mike Linville, Bill Becks’s (Kokomo Attorney) cousin. Elkhart County was very welcoming at their Christmas party — And of course we got signatures. My parents are two of the kindest people I know. It is easy to be thankful on thanksgiving. Fun last night. Some are tired this morning, but we are excited that we will celebrate with my parents today. It will be different without my brother Max. Yes, the Souder clan thought I did a great job on the turkey. It was a special treat today to have our nephew Zachary visit from Texas. The Souders gather for Thanksgiving dinner on Friday. Mark and Diego are diligently preparing the turkey. At the Vigo County dinner, we ate with Financial Advisor Ken Warner and his wife Cathy. We talked about all the difficult unintended consequences Washington’s recent legislation has had on the financial industry and how it will hurt many Washington hoped to help — too many regulations. Visited Clay County this week and met some very nice people. Bill Jeffries and I are pictured here with Patti Foxx, the Clay County Republican Chairperson. We also visited Pappys Barbecue. The fun folks in the second picture are manager Skyler Holyfield, Katie Ingle, and Matt McDonald. It was a pleasure to join volunteers, Tim and Nick Bennett and Frank Faulkner for the LaPorte County Lincoln Day Dinner in MIchigan City. They worked hard to obtain signatures to allow me to be on the ballot for U.S. Senate. Pictured with these friends are Porter County Attorney, Dan Granquist, a former member of Temple Baptist church in Kokomo in the 70's and a new friend who was originally from Poland. Last night, I attended the Porter County Right to Life dinner. Daniel drove me there, and afterwards we played pool at the Valporaiso University Union Building. That was a lot of fun. In a Q&A with the College Republicans at Indiana State University, Mark explained his vision and why he chose to enter the Indiana U.S. Senate race. Mark is pictured with Mr. Bailey who hosted and served a wonderful meal for the Carroll County Lincoln Day dinner. Volunteers Ellen Kizik and Renee Pritz worked hard once again helping to obtain some of the 500 signatures in Hamilton County. This time it was the Hamilton County Fall Dinner. Mark spoke at the Allen County Republican Party Reagan Bean Dinner. House Majority Leader, Kevin McCarthy, was the keynote speaker. Inspiring and funny, he commented that the only television station with more letters than viewers is MSNBC. Mark's wife, Nancy, was able to join him. Pictured is Katelyn Ewing (left), a student at Anderson University and Ashley Dexter (right), a student at Taylor University. Pictured is Coleen Godfrey Bonahoom who is involved with Americans for Prosperity. She was joined by her husband Greg. Ellen, a campaign volunteer, and Mark are pictured with Francisco Itriago. He recently returned from Venezuela and is the Director of Utility Transformation at Indianapolis Power & Light. It was a blessing to attend the Marion Veterans Day Parade with my father LD, a Korean Army veteran, and my father's close friend, Howard Martz, a WWII air force veteran who are pictured with Col. Marcus Thomas, of the Indiana Army National Guard who gave a stirring speech. Interesting to see Senator Joe Donnelly at today's parade. 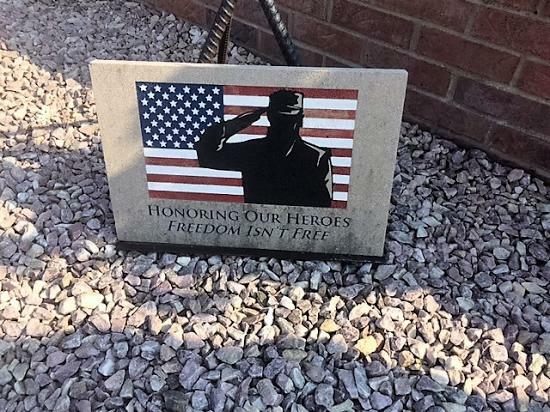 Thank you veterans for your service. Tonight, Mark Doud, Jeff King, Nancy, and I are working on the 4,500 signatures needed to get on the ballot to run for U. S. Senate. This time, we are at the Brown County Lincoln Day dinner. It is peak season, and the leaves and hills are gorgeous. The dinner is being held about 20 minutes from Indiana University. Mark and Nancy enjoyed the Indiana Family Institute dinner. Afterwards, they had a nice visit with State Senator John Crane‘s father. Interestingly, his brother was Phil Crane, a former U.S. congressman from Illinois. Getting 500 signatures in every district in order to get on the ballot is harder than you might think. That is why we want to give some special recognition to volunteers who helped get signatures at the Allen County Reagan Bean Dinner. Mark Doud Is an old friend who worked for senator Lugar in Washington DC while Mark worked for Senator Coats. He also went to Taylor University. Pictured is Matthew Stachler, a student at Snider High School in Fort Wayne. Mark is glad to have Ellen Kizik back from China and helping on the campaign. Ellen and Mark attended the Marion County Fall Dinner. She is pictured here with John Frey, a Montgomery County commissioner. Last weekend, Mark took a break from the campaign to host a reception for his daughter Ana who married Jake Phillips (left) last June. After President Trump‘s speech, Mark met with the Blanton family. The Blantons both work at Chrysler, and they have four children. They are from Greentown. President Trump actually used them as an example of how the doubling of the deductions for families with children would benefit this Greentown family. The annual Pregnancy Resource Center’s dinner at the First Nazarene Church in Kokomo was very moving. Nancy and Mark enjoyed sitting with tennis friends Dan and Jen Phillips. Mark drove to Evansville to be part of their Right to Life gathering. The picture is of Sue Swayzee honoring State Representative Ron Bacon. 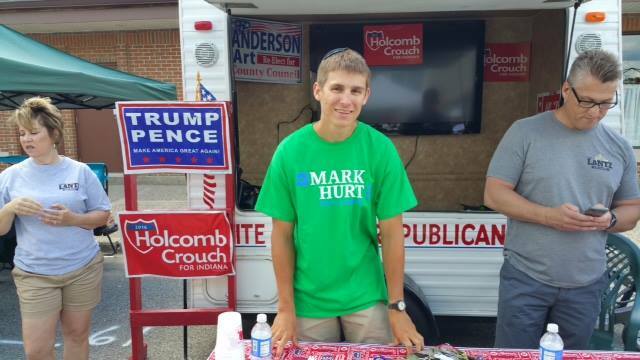 Mark was joined by a group of friends and volunteers at the Tipton County Pork Festival. He is especially proud of the young, millennial volunteers which are the next generation of conservative leaders. 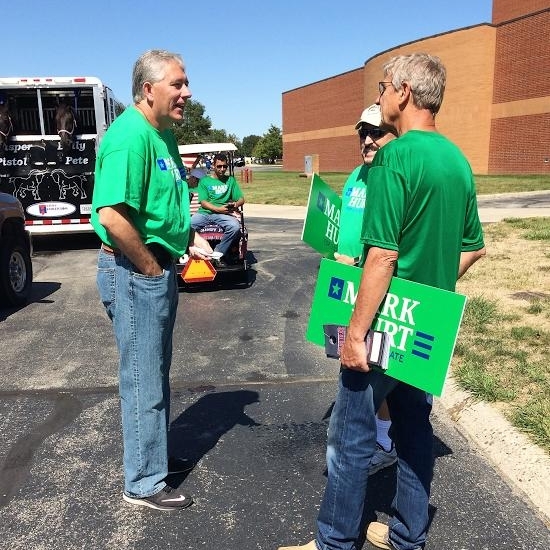 Mark attended the Johnson County barbecue. The pleasant surprise there was that Mark’s cousin, Duane Burgess, was there. He is running for Sheriff. After the Kosciusko County fish fry, Mark met with lawyers from the county. Mark's friend and business associate, Felicity Havriila (on his left) invited Mark to meet with members of their bar. There’s no place like home. Mark and volunteers followed the Madison Grant band at the annual James Dean days, listening to old favorites like Sweet Caroline. 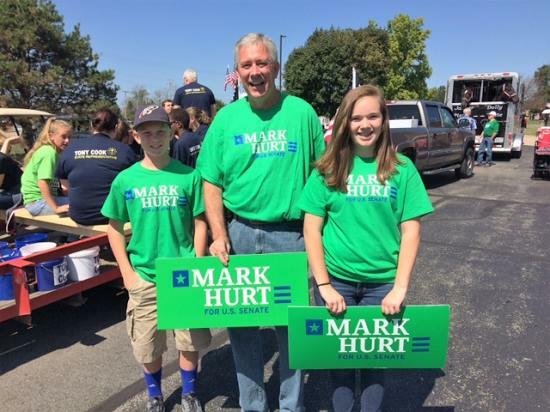 The crowds were large, with many family and friends on the sides wearing Hurt for Senate shirts. Many Vietnam veterans gather around James Dean days about half way between Kokomo and Fairmount. Mark and his dad enjoyed spending some time with them recently and will walk in the James Dean Days parade this September. This will be a sad year, as it was always a highlight for Mark's Brother Max. 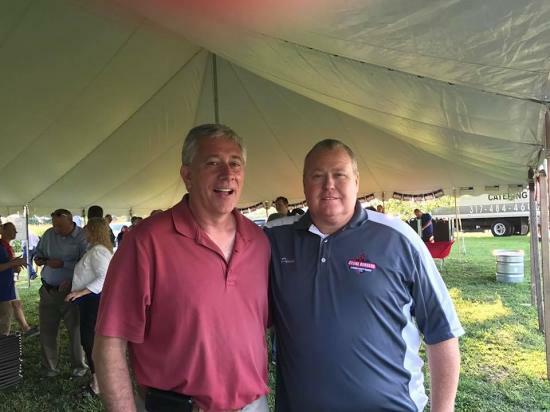 After the Tipton Pork Festival parade, Mark went south to the Frye Picnic on the Farm in Greensburg. Mark and Jeff King (pictured) and Nancy enjoyed visiting down on the farm. 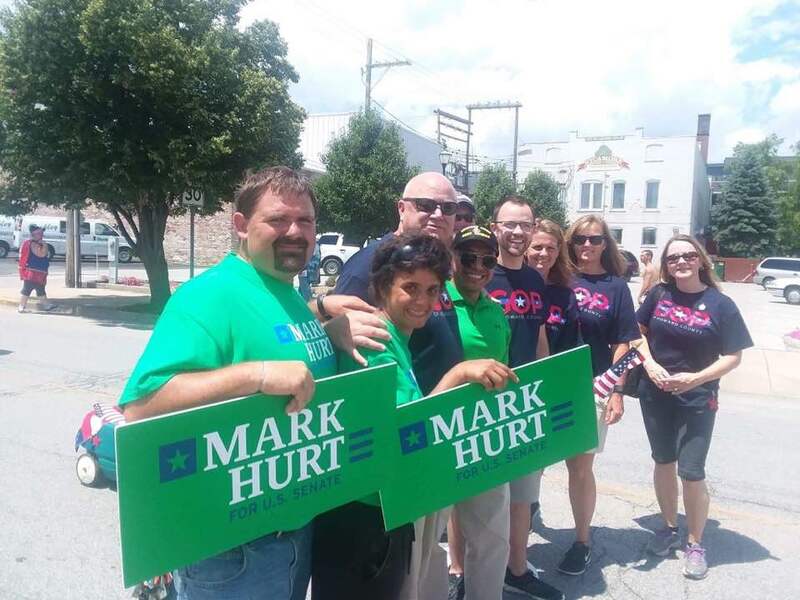 Mark joined a team of friends and volunteers, putting together mailings for the campaign. From the pork producers' breakfast to the cattlemen's ribeye steak sandwich, the Indiana State fair was fun. Here, Mark is speaking to governor Otis Bowen's D.C. Liaison, Judy Reynolds from Marshall County. Dale Ward is the owner of the Whistle Stop restaurant in Monon.Dale showed us generous hospitality and gave us a great tour of his train museum which was nothing short of amazing. Mark spoke at the Indiana Conservatives Conference, outlining his vision for conservative leadership in the Senate. Jim and Judy Buck had a wonderful turnout at their garden party. Their hospitality is always very much appreciated. I am pictured with two of my hard headed friends: Frank and Peggy Faulkner. Indiana works. Under the tent, the picture is with Dr. and Mrs. Strus. The picture where I am speaking has Judy Buck on my right. She and Jim worked incredibly hard, and now deserve a rest. Mark joined the Kokomo Early Risers Rotary Club to discuss mental health issues facing our community and state. Katie Nielsen is pictured with the owner Nine Irish Brothers, Jerry O'Bryan. Katie and my wife Nancy began their banking careers working on the "sweathog" team. The sweathogs analyzed the financial statements of small businesses in Indianapolis to determine their credit worthiness. Interestingly, some of these small businesses have grown into the great businesses in Indianapolis. This is just an example of why legislators need to do all they can to support small businesses. 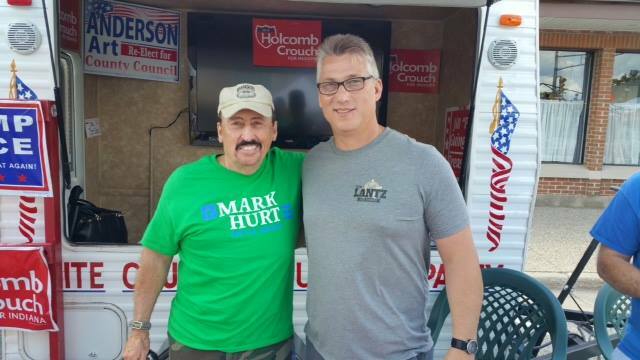 Mark enjoyed the beautiful Lake County 4H fair at Crown Point. 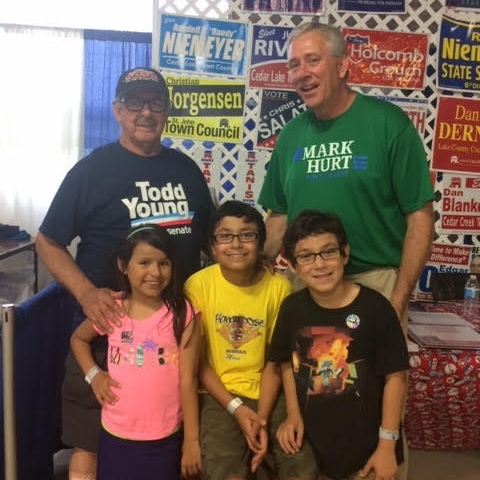 He is pictured here with the former head of the East Chicago Republican Party, Raymond Lopez, and Raymond's grandchildren. Carl Waterman is the CEO of Bridges of Hope which is a substance abuse re-habilitation center. We had a very interesting conversation at the Putnam County 4-H Fair. The Howard County Lincoln Day dinner provided a little family time. I was able to sit with Nancy and Ana and Jake. Nancy took the pictures. Jake and Ana went up to see Governor Holcomb. Ana said that the governor said that it was his honor to get his picture taken with them. She said he was really tall. We also want to thank Jennifer Lee and Nic Bewley for passing out all my materials at the dinner. Nic is not in the picture, because he had to leave early. We walked 4 miles at the Elkhart 4H fair. There were lots of people – in fact, it is the second largest county 4H fair in the country. Thanks to you who joined us (especially Daniel, Kaitlyn, and Jennifer). And thanks to State Representative Curt and Mary Nisly Who treated Nancy, Daniel, and I to a haystack after the parade. The haystack is a specialty food at the Elkhart fair. Mary actually takes a break from nursing to help run the fair. Thank you Tim and Nick Bennett and Kaitlyn Ewing for joining me at the Peru Circusparade. It was fun even though we walked in the rain. I stopped by the DARE Booth at the Carroll County 4H fair. Rich Ferguson, on my left, is a retired deputy sheriff from Kokomo. He is now a DARE officer in Carroll County. Mike Goodrich, from Northwestern high school, is now the vice principal at Carroll high school. Mike is pictured on my right. Had a great conversation with Darlene Edgecomb at the Marshall County 4H fair in Argos. This is one of my biggest supporters, my brother Max. Above: My dad and I enjoyed visiting with the Owens' family before the parade in Alexandria began. Steffanie Owens is a commissioner in Madison County. It was a special time for my dad, because he was a barber in Alexandria before he began working at Delco. It was a bit of a trip down memory lane for dad and I. Right: The Green Town Fair was extra special this year as time was taken to remember Deputy Koontz. I enjoyed spending time with John Zeck, Jim Papaceck, and Bryan Kirpatrick. It was an honor to spend time with Rubie Taylor (left) and Angel Carson (right) at the Tipton County 4-H Fair. It was a brainstorm with the millennials' night, and it went great. Taylor, Indiana Wesleyan, Purdue, Anderson, and Indiana state we're all represented. Andrew Ireland from IU, was patched in from Texas. Around the table from Mark's right are Claire Bokma, Tim Bennett, Caleb Sedam, Nick Bennett, Jennifer Lee, Keaton Jones, Nick Bewley, Adam McMickle, and Kaitlyn Ewing. Thanks to all of you for sharing your ideas, and agreeing to provide a lot of ground support to this campaign. Thank you Kaitlyn Ewing, and Nancy and Daniel for joining me at the Frankfort parade. It was a lot of fun to pass out door hangers and candy to so many friendly people. One man even had a White Socks shirt on, and this made Nancy very happy. Thank you daughter Ana and Jacob Phillips, and Kaitlyn Ewing, and Caleb Sedam for representing me at the Haynes Apperson parade. Thank you Caleb Sedam and Bill Jeffries for representing me in Monticello. While we rested and relaxed, others worked on my behalf. Thank you Caleb and Eli Sedam for representing me in Walton and Twelve Mile. 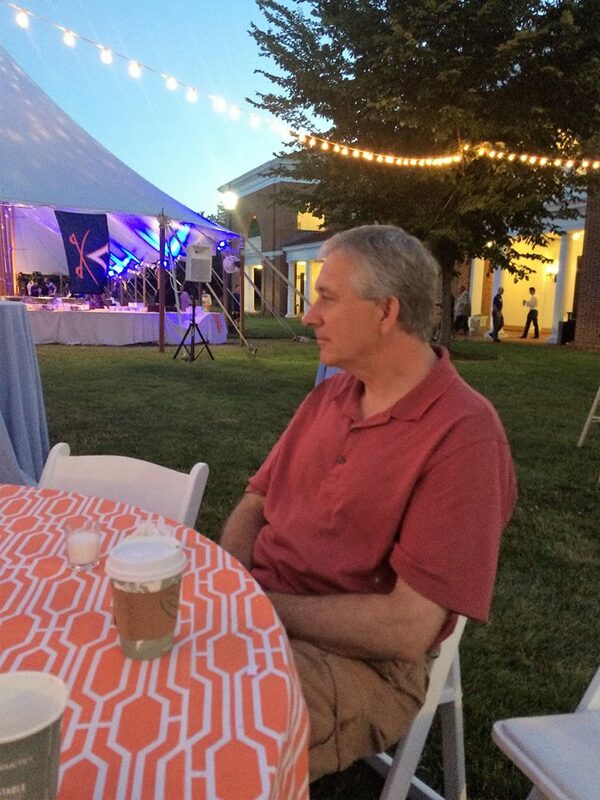 We enjoyed some rest and relation in Charlottesville, Virginia where Nancy was working for the CFA. 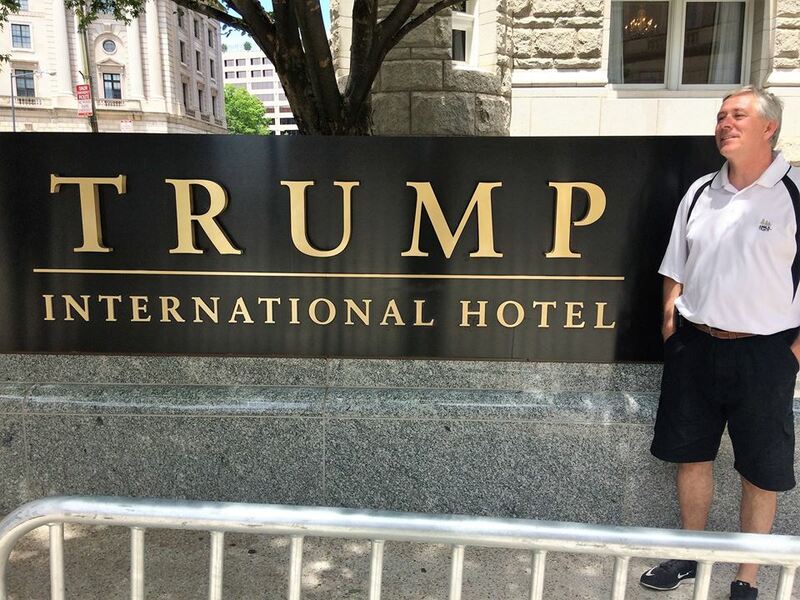 On the way home, we checked out the new Trump International. Jim and Kelly Ratliff hosted a very fun reception at the Hawthorns Golf and Country Club in Fishers. Jim is on the left in this picture -- we missed Kelly who had to hurry off to help the kids. We know how that goes. Getting to know lots of great people brings joy to this campaign. Mark and Jeff King (old high school buddy who served in the military for many years) attended the Ripley County Lincoln Day Dinner in Batesville, Indiana. Mark is pictured here with Mayor Mike Bettice as they talked about hospital beds at Hill Rom and caskets at Batesville Casket Company. Mark also enjoyed visiting with State Rep Randy Frye and his wife Deb at the Ripley County Lincoln Day Dinner. The couple to the right of Nancy are Bill and Cheryl Jeffries from Zionsville. Bill has been an incredible advisor. He has been willing to speak at the last two receptions, and his listeners are captivated by his knowledge of the military. We must get these fine young men and women the equipment they need, and we must never forget our vets who put their lives on the line to keep our Land free. Mark and Jeff ate with three ladies from the Republican Women’s Group. Jeff is pictured with Dorothy Green on the right, Marilyn Gausman on the left, and Mary ann McCoy in the middle. My dad, pictured in the hat above, asked me to accompany him to the Fairmount Legion to celebrate their 50th anniversary. The other two veteran friends are named Terome and Gordon Gough. I am also pictured with other celebrators. When I went to the Clark County Lincoln Day dinner, I got to see the beautiful lights illuminate the walking bridge on the Ohio River in Jeffersonville. At the dinner, I enjoyed spending time with Wilby Edwards. Wilby and I both have relatives in Edmonton Kentucky. I also enjoyed the Clark County Republican Women'sGroup. At the Blackford County Lincoln Day dinner, I enjoyed meeting Melissa Fear. Melissa hosted the book table. I was privileged to attend a special Federalist Society conference in Washington DC. The conference was about stopping the unconstitutional growth of federal agencies. The picture that I took is of my friend the former congressman David McIntosh listening to President Trump's budget director, Mick Mulvaney. Indy driver Ed Carpenter waves to the parade crowd. It was a great parade with lots of Back Home in Indiana music. Just fun to be a Hoosier. At the Cass County Lincoln Day dinner, I was able to visit with Caleb Sedam. Caleb is a senior at Purdue majoring in biology. He has since become our newest volunteer. Mark and Nancy had a little downtime with friends Curt and Darlene Welke after the Welkes' hosted a very fun fund raiser attended by many friends in the Kokomo area. Bill Jeffries was the guest speaker. Bill, graduate of and former instructor at West Point, former Special Forces, former head of nuclear operations in Europe, and former associate of General Schwarzkopf, gave a fascinatingbut sobering talk about what has happened to our military over the last eight years. We must do a better job of supporting our men and women in uniform..
Bill Jeffries, invaluable adviser, represented me at the Putnam County Lincoln Day Dinner in Green Castle. He is pictured here with Indianapolis radio talk show host Habul-Hakim Shabazz whose show I was honored to be on. After speaking at the Martin County Lincoln Day Dinner, I visited with Sheriff Travis Roush and his wife Candice, school superintendent. Also at the Martin County Lincoln Day Dinner, I met Kay Barber, secretary of the Republican Party and her husband who are both Crane retirees. To my left is City Council Woman Barbara McFeaters, and Carolyn McGuire, County Assessor Carolyn McGuire is also in the picture. Mary Ellen Van Dyke is the Executive Director of the biggest Right to Life group in Indiana. She and her husband, Jim,were at the Lincoln Day Dinner in Evansville. I also enjoyed visiting with Bashar and Natalie Hamami at the Evansville Lincoln Day dinner. Bashar and Natalie were originally from Syria.